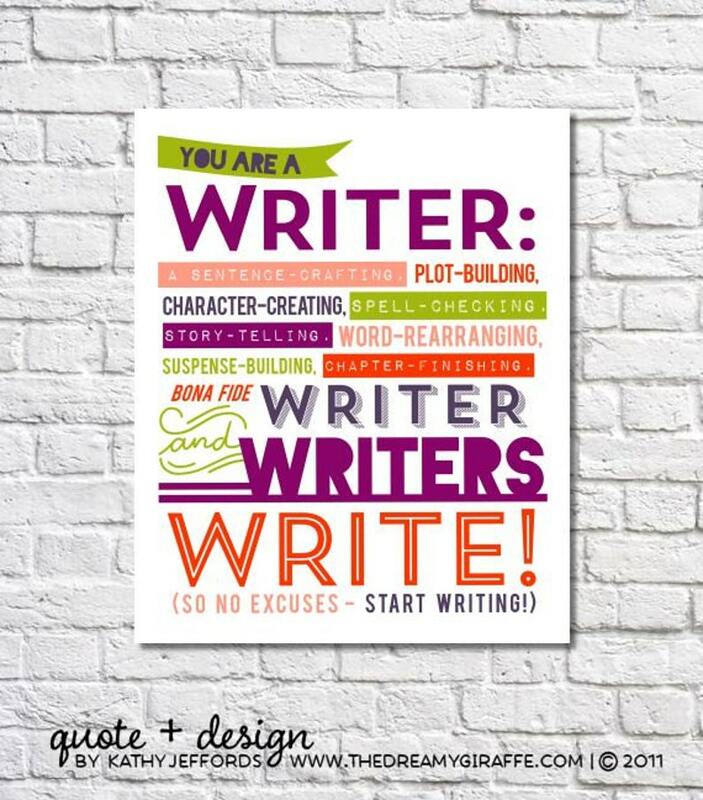 Hey, writer person....yeah, I see you procrastinating over there. I heard you say you'll write tomorrow when you feel like it. Which you also said YESTERDAY. And maybe even the day before that. I'm not being Miss Judgeypants. I know firsthand how easy it is to sit down to write and to instead spend the day doing everything but. First, you take two seconds to read that very important article or just checking your social media feed one more time. Ooh, I was supposed to find that recipe for my mom. And OMG, it is SUPER vital that I e-mail Beatrice from first grade who I haven't seen since to find out what she's been up to. And, oh, playing that game JUST ONCE will only take five minutes. For sure, after lunch, I'll write. Before you know it, the day is gone and you didn't write and feel all yucky about it. Because social media is cool and so is Beatrice from first grade. But you are not a professional social media-checker. You are a writer. So put away your excuses and all the 500000 bazillion distractions the lovely World Wide Web has to offer and get to it! ● MATERIALS: Regardless of what size you order, my prints are printed with fade resistant bright and vibrant inks on a professional luster paper that has a (ever-so-slightly shimmery but not at all shiny!) finish that enhances the colors and makes them pop. ● PLEASE NOTE: Prints will be shipped to you from my professional printing partner and ***will not be signed or dated***. ● ALSO: Colors vary from monitor to monitor, so the colors on the print you receive may look slightly different than what you see on screen, but I guarantee they will be beautiful. Prints are unframed but if you'd need some tips and tricks I've picked up along the way on easy/affordable/awesome ways to frame your print, please just ask...there are many options and I'd be happy to share my ideas with you! ● SHIPPING: Prints 11" x 14" and smaller are shipped flat. Prints 16" x 20" and larger are shipped in sturdy cardboard tubes. All prints within are sealed in poly bags to ensure they will stay dry & protected during their travels. We use USPS, FedEx, and UPS to ship larger prints. No matter which carrier used, you will receive a tracking number as soon as your package is on its way. My goal is for everything to arrive to you in perfect condition. If there is any problem at all with your order, please get in touch so I can resolve any issue you have. Words & design © 2011, Kathy R. Jeffords. Copyright not transferable with sale. Please note that colors vary from monitor to monitor, so the print you receive may look slightly different than what you see on screen. My husband loved it! The instructions for how to frame this were very useful too. Would highly recommend this seller!!! Great bag, arrived promptly, was exactly as I'd hoped. 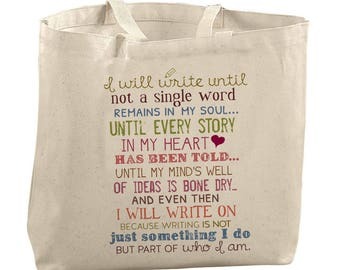 I love the quotes on it, inspiring me to get back to writing! Can you rush my order/deliver by a certain date? Unfortunately, I am unable to accommodate rush orders. Standard prints will be put in the mail within 2-3 business days of payment, and delivery time will depend on your location. If you purchase a print that requires customization or personalization, your custom print will be put into the mail 2-3 business days after you've approved the proof. Within the United States, your package will usually arrive within one week after shipping (many times much quicker!). Prints shipped outside the country can take quite a bit longer and there may be delays due to customs, so please consider this if you need your order in a hurry. If you need your art for a specific event or an occasion, please place your order well in advance. Do you offer other products or other size prints? Gift wrapping? Framed prints or framing services? ❤ I only sell the one size (8.5" x 11") print listed in my shop. I am unable to sell larger or smaller prints, already framed art, or other products featuring my art. I apologize for any inconvenience. ❤ I do not offer gift wrapping services, but if you are shipping a print directly to someone else as a gift, I will be happy to include a note from you to them. Just let me know what you'd like it to say! ❤ PREFER TO PRINT YOUR OWN? Digital printables (in JPEG or PDF format) ARE available for most pieces upon request. Please just ask! Do prints ship from an animal-free and/or smoke-free environment? My home, office and I are all smoke-free. Packages *do* ship from a dog-friendly home. My pups do not come into direct contact with any materials/supplies I use or my workspace, but they do come into direct contact with me, so if you are allergic to animals, please be aware of this! All South Carolina residents will be charged the applicable sales tax. I see you ship USPS First Class. Can you use another method to ship my package? I have found that for my prints, First Class typically arrives just as quickly as Priority, but if you'd prefer your package ship Priority, please just contact me before purchasing and I can do that. I do not offer any other upgrades (such as overnight/express) or use any other shipping companies (such as UPS or FedEx) at this time. All prints will ship in a protective sleeve within a rigid mailer to prevent bending and damage. What is the best/easiest way to frame and/or display your prints? I have a HUGE list of easy & affordable framing/display tips, tricks & suggestions. If you'd like this, please just contact me and I'll get it to you! Funny Kitchen Print Fork Art Quirky Kitchen Artwork Utensils Art Kitchen Wall Art Quote Sign Funny Home Decor Funny Kitchen Decor 8.5" x 11"